Eddy Shih-Hsin Yang, MD, PhD, associate professor and Regional Oncology Active Research (ROAR) Southeast Cancer Foundation Endowed Chair at the University of Alabama-Birmingham (UAB), is an expert in DNA repair pathways in cancer, with particular interest in targeting these pathways to enhance the therapeutic index (a comparison of the amount of therapeutic agent that produces a therapeutic effect to the amount that causes toxicity) of existing anticancer drugs. As a radiation oncologist, Yang understands the impact of cancer therapies on DNA integrity, as the efficacy of many of these therapies, including radiation, is dependent on their ability to damage cancer cell DNA. Yang’s research covers a range of tumor types, since inducing DNA damage is one common mechanism used to destroy tumors. However, he has a particular interest in breast cancer, which he attributes to his experience at UAB. “At UAB, there is a strong breast cancer research/clinical team, and Edward E. Partridge, MD, Albert F. LoBuglio, MD, Andres Forero, MD, and others greatly supported my career development in breast cancer,” he recalls. 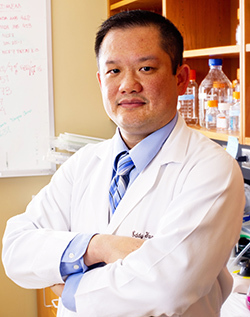 Yang also credits important interactions and collaborations with the patient advocate group at UAB for fueling his interest in breast cancer research, and for reminding him to always remember the human impact of his work. “Specifically, the late Beverly Laird, PhD, was integral to my understanding of the important areas of breast cancer research from the patient perspective,” he says. It is important to note that this is not Yang’s first grant administered by the AACR to study breast cancer research. In 2012, as an assistant professor at UAB, he received the AACR-Genentech BioOncology Career Development Award for Cancer Research on the HER Family Pathway to study the role of the HER2 receptor in mediating tumor susceptibility to PARP inhibition. “The 2012 grant greatly impacted my career development,” recalls Yang. “Thanks to the AACR-Genentech BioOncology grant, I generated the necessary preliminary data to garner additional funds for my work from other sources. I predict that the 2015 AACR-Triple Negative Breast Cancer Foundation grant will have a similar impact on my career.” Indeed, he has already successfully obtained additional funds for some of his work, through sources such as the UAB Breast Cancer SPORE and Susan G. Komen. Ultimately, Yang anticipates that the knowledge gained from these studies will lay the foundation for future clinical trials. He also expects that he will be able to leverage these data into larger federal grants from sources such as the National Institutes of Health and the Department of Defense, so that he may continue his important work to improve therapies for breast cancer patients.